CES 2015: Philips NC1L are battery-free noise-cancelling headphones | What Hi-Fi? It's hard to walk for 10 paces without seeing a "world's first" claim at CES, but this one from Philips is impressive – the NC1L earphones are noise-cancelling cans to make do without a battery. That's because they connect via the Apple Lightning port to draw power from your phone or tablet - and to take a digital audio signal in order to take care of the digital-to-analogue conversion inside the earphones. 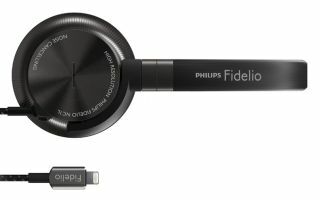 Yes, the Philips Fidelio NC1L noise-cancelling headphones also have an integrated 24-bit DAC alongside "a full chain of audiophile-grade components" and neodymium drivers. There are three sound modes: active noise-cancelling, open-ear listening (allows you to hear ambient noise) and natural voice (aimed at making voice calls using the in-line mic). They are the second pair of headphones from Philips to connect via Lightning - following in the footsteps of the M2L headphones, which were the first pair on the market to do so. Memory foam earpads certainly sound comfortable; the headphones are also "fully foldable", which should make them nice and portable - they're certainly going to prove more portable than carrying a DAC. The Philips Fidelio NCL1 headphones are due to go on sale this Spring and have a price tag of 299 euros. We will confirm UK details ASAP.